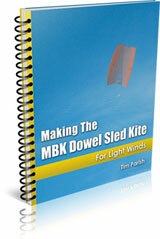 Not every Sled kite is super simple, although my MBK designs are quite straightforward to make. Some designs for kids can be made in as little as 15 minutes! Or you can buy soft ones that can be stuffed into a very small space for carrying. Further down, there's a photo of a couple of bigger ones of the soft variety. The original type of Sled has 2 straight spars running the length of the kite, and a tail hanging from the bottom end of each spar. Air pressure then keeps the sail open and holds the kite's shape while it flies. Sleds, whether soft or sparred, tend to have more pull on the flying line than other single-surface kites of similar sail area. Still, any such kite less than 1.2 meters (4 feet) tall is manageable in Moderate strength winds. Almost no set-up time before flying! That's the beauty of Sleds of all kinds. Let me try and sum up the most common variations that can be found in this kind of kite. like any kite, the sail can be decorated with any design you like! Let me make a few comments on each of the above points. Size. I've read of a giant Sled kite that was once flown at a Dutch kite festival. From leading edge to trailing edge was no less than 14 meters (45 feet)! On the other hand, there is a Pocket Sled kite available that is sparless and so scrunches up to fit in your shirt pocket! A small, very cheap children's kite. It measures 33 cm (1 ft) in height when in the air. I'm sure even smaller ones have been made and flown too. Extra spar I don't know how many of these are flying now, but an early variation on the basic design had this extra spar running right down the middle of the sail, with no bridle lines attached to it. Inflatable spars. These are tubes of material that inflate with air pressure during flight, and so hold their shape and act like rigid spars. See the picture at the top of this page! Sometimes there are more than 2 spars. The nice thing about these is that the kite is totally collapsible and takes very little storage space. And of course, a fully flexible kite is much harder to damage than a kite with spindly rigid spars. Non-parallel spars. The very first Sled kite had spars that were closer together toward the trailing edge of the kite. Hence, the kite had a slightly tapered look in the air, being bigger at the top than at the bottom. Most Sleds these days however have spars that are parallel to each other. Vent holes. This feature has the very practical purpose of allowing the kite to fly in a stable way without any tails attached. It doesn't really matter exactly what shape the holes are, so many creatively designed vented designs may be found. As long as the vents are near the trailing edge, and let roughly the right amount of air through, they work fine. Wide or narrow tails. 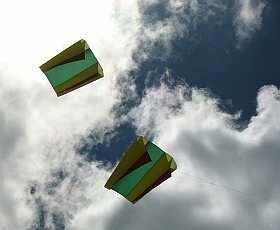 Since the trailing edge of a Sled kite is completely flexible, adding a single tail is best done by attaching it across the full width of the sail. So they say. 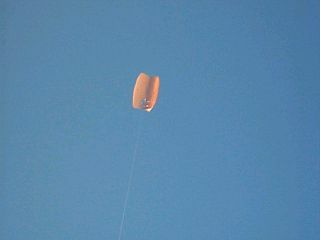 Mind you, I have modified a Baby Sled kite by adding a narrow tail to the center of the trailing edge with no problems! The tail material was extremely light, so that might have helped. Normally, thin tails are attached to the bottom end of each spar. An interesting variation on this involves attaching each end of a single tail to the spar ends. The tail then forms a loop, which tends to pull the bottom ends of the spars towards each other in flight. This helps stability. It drags a bit more too, so less tail material is required this way than if two separate tails were used. Decoration. At one extreme, Sleds can be built with plain, even clear, plastic or rip-stop nylon. But of course, artistic kite builders love to make the kite sail their canvass! Like Chinese kites, sleds can be real works of art. Despite the great variety in Sleds flying today, most of the usage of these kites is in either kite fishing or children's recreation. The fairly big Sleds you sometimes see at kite festivals might form a third category I suppose. But if you look at pure numbers, there's a lot of anglers out there, fishing in the sea. Those of them that use kites to take the line way out often use Sled kites. 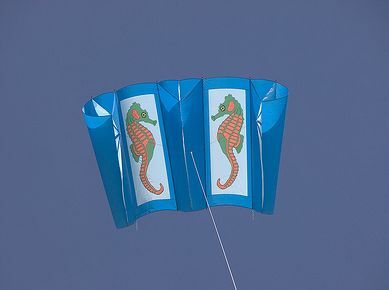 These kites are made for fishing, and are sold from fishing stores. They are rigged to fly low, since the idea is to take the fishing line a long distance across the water from the angler. Looking at even greater numbers, kids have a fascination for kites, and many of them are flying little Sleds! It's amazing the attention you get from kids when flying kites. I sometimes find that out when testing the latest MBK kite I have made! I won't go into any more detailed history except to say that people have constantly found new ways to alter the original Sled concept. Brightly colored sleds in many different configurations can be seen advertised in the online kite shops. Besides that, kite enthusiasts are always experimenting with their own versions of what has gone before. Occasionally, something quite new and different pops up. However, people have found that complex kite designs don't always fly well on the first attempt! Simple is best.